The contempo wheel is a great accent for the contempo Christmas set. I love the way it accents this card. I am really excited to use it on a card that is not Chritsmasy. This is one of the cards we made in our last workshop. It is almost exactly like the one in the Stampin'Up! catalog with a few exceptions. I added the waffle paper as a frilly edge. At first I wasn't sure what to do with it, but once I started playing with it, the ideas started to flow! It is currently in the SU mini catalog. 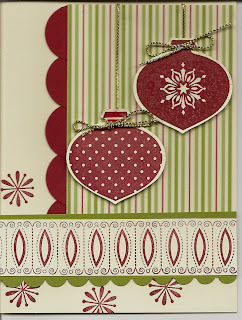 Secrets: Stamp background with Crumb Cake ink for a soft look. 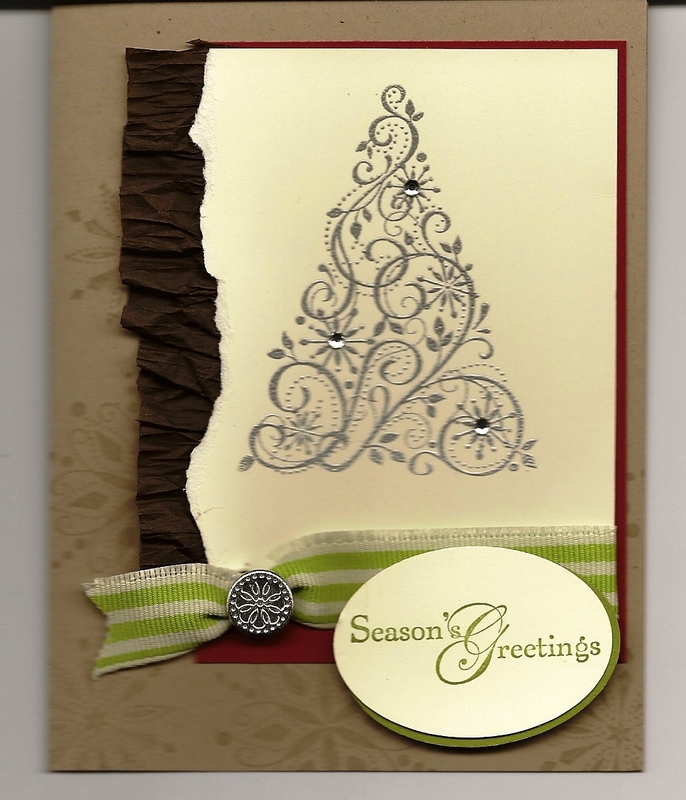 Emboss the tree with silver embossing powder, then put on a few rhinestones. (These are great because they come with a sticky backing!) Pinch pleat the waffle paper down the torn edge of the vanilla piece. Cut the ribbon in half and fray the edge, then pinch in the back of the brad, then use the brad as usual. The punched ovals are the same size, just off set a little. Please let me know if you would like to order any of the supplies used to make this card!